Reflections on being courageous for the Gospel. I guess it’s about time I breathed life into my blog, again. 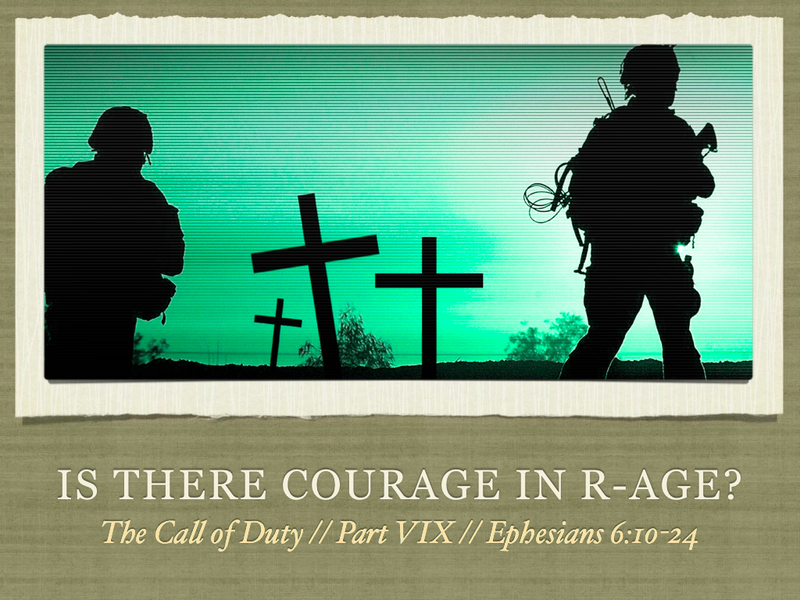 Over the last weekend, I preached the final installment of “The Call of Duty: R-AGE digs deeper into Ephesians”. It was based on Ephesians 6:10-24 and the armour of God. I titled the sermon, “Is there courage in R-AGE?”. I had the luxury of having three weeks to prepare for this sermon (due to the combined adults and 180° Easter outreach services) and extra time meant that this sermon could pack more punch. Most times at the end of a service, I always feel I’ve preached the worst sermon of my life, but surprisingly, I enjoyed preaching this one. Not because I tickled minds with interesting nuggets of information, but because I felt that I had executed the prophetic burden God laid on my heart for the youths. It’s similar to Apostle Paul’s cry for the believers in Ephesus – to boldly proclaim the Gospel. I challenged two groups of young people at the altar; those who used to preach the Gospel boldly and those who have never preached the Gospel boldly before – that the Holy Spirit would strengthen them to do so. While I was thankful for those who responded, there were more who didn’t and I wondered why – was it due to my inadequate delivery of the message, their apathetic spiritual condition or simply because God didn’t plan it that way? Or was it something else beyond my comprehension? I couldn’t put a finger to it but it drives me to intercede more intensely for my beloved youths. David Lee was the emcee for R-AGE @ GI and at the closing of the service, he echoed what I had actually said at R-AGE @ GII – that the responsibility of evangelism doesn’t fall on the shoulders of the leaders, pastors and those who are more fervent in their faith, but on everyone who calls himself a disciple of Jesus. How could we remain unmoved if the love of Christ has already moved us? It is my earnest prayer that R-AGE would experience the Father’s love first-hand! “Stop evangelising. Instead, start loving people in the name of Jesus”, I first heard Ps Edmund Chan say that when I traveled with him to Perth last October. He repeated that statement at the recently concluded Grace Leaders’ Retreat and it was a sobering reminder for me. I had a short SMS exchange with Gabrielle Ong this morning and I encouraged her not to give up on proclaiming the Gospel to her pre-believing friends. I told her that one of the most effective ways of demonstrating the Gospel is to find opportunities to pray for people – you “speak life” into them and they get a chance to see your faith in action. It works! Back to the sermon… Well, I’m not sure about other preachers, but the thing I enjoy most about preparing a sermon is how much I learn and am challenged through what I read and write. I already know what God would want me to do in response to my sermon and I look forward to walking in obedience this week. It is my prayer that R-AGE would take ownership of the souls within their communities who haven’t met Jesus. Even as I type this, my heart is moved by the compassion Jesus has for the ones who are suffering and the ones who do not yet know Him. I am thankful for the Spirit’s reminder in my life – that my occupation isn’t one of a part-time youth pastor but a full-time Gospel preacher! I must never lose sight of reconciling others to God through the Gospel! It’s going to be an awesome week, my dear friends. Let’s raise the shield of faith on each other’s behalf, gird up our loins with the written truth, wield the power of the spoken truth and advance the Gospel for the King! What a privilege to shepherd R-AGE – I am thankful for this season of my life. God is good. exactly how much should a leader give? I attended the first session of the Fatherheart conference last Friday and while I appreciated what James Jordon shared, it was the ride back home with Garry and Peiying that I enjoyed more. The two of them kindly offered to give me a lift home. I took my seat at the back and we caught up with what God was doing in our lives. The last time I had a chat with Garry was at the 40DOC thanksgiving service. And during that conversation, he shared about how he was contemplating whether to carry on leading the cell that he had been facilitating during the period of 40DOC. I was so encouraged to hear that he decided to obey God to serve as a cell leader despite his verbalised inadequacies. Garry’s a straight-talking guy – the man on the street – who wears his heart on his sleeve. He told me that he felt like he wasn’t doing enough as a cell leader. Like any responsible leader would, Garry wanted to do more. But he wasn’t sure where he should take the benchmark from. I had all of five seconds to think about how I should respond to his sincere and honest question. I didn’t want to give him a Sunday-school answer or something that wouldn’t be of any help. He wanted to ask for my opinion because he felt that since I was leading R-AGE, I would be able to identify with his question. I told him that to answer that question, we would first have to take a step back from it. It will never be enough; of course a leader could do something more, but there’s no end to it. In my reflection, I think that the greatest decision that a leader could make is to obey what God is prompting him in his heart to do. It could be any of the above, or it could be simply to wait and not take any action. “Obedience is the highest expression of stewardship” – words of my mentor, Ps Edmund Chan, that I have already engraved onto my heart. It’s not about how much you do, but more of why and what you do, and who you do it for – God or Man? The right deed at the right time for the right person is as good as a divine appointment; the best thing a leader can do is to do what the Holy Spirit impresses upon him to do – it will always be perfect. I also believe that the greatest gift a leader can give away is to give his people Jesus. Jesus (the Gospel) is undoubtedly the best gift for any believer (or non-believer). In my years of mentoring, I always tell myself that my main priority as someone’s mentor is to connect him back to the Vine (John 15:5). I am not Jesus – I cannot be there for him 24/7 – but Jesus can. If a person is properly connected to Jesus, he will eventually yield himself to the Lordship of Christ and make Jesus the Master of his heart and life. One of the emblems of my life is that “Apart from Jesus, I can do nothing; I am absolutely nothing without Christ”. I believe that if one is not connected to the right Vine, the fruit that he bears isn’t the right fruit. Hence, I’m inclined to believe that the most important thing a leader could do is to give his members Jesus because Jesus is all they need (not you, fortunately or unfortunately). And if Jesus is everything, then Jesus is enough. I am reminded of Jesus’ edict for Peter (and all of us) in John 21:15-17. (This is the same passage that I laid the foundation of R-AGE @ GII upon.) Jesus’ response to Peter’s triple declaration of love for Him was to “Feed [His] lambs”, “Tend [His] sheep” and “Feed [His] sheep”. I’ll elaborate on this with another post some other time (as well as how I passionately believe that pastors should just pastor) but for now, the question that I have for every Christian shepherd is, “What are you feeding your flock?” and “How are you tending your sheep?” If a leader can answer that with his conscience clear before God, I’d run over to pat him on the back on a job well done. So exactly how much should a leader give? Not much – just Jesus – because if Jesus is everything, then Jesus is enough. Be a good shepherd – it’s a privileged position to serve God in. take, take, take it all in again. I apologise for the delayed update of last weekend’s sermon because work has caused this week to pass rapidly. It’s well-documented that I’m not a fan of administrative work (even though I think I’m pretty decent at it); I spent the bulk of my energy in the last few days assembling the ministry action plans and the budget for R-AGE@GI and R-AGE@GII. It’s a huge step up from last year where I only needed to put together the R-AGE@GII budget. This is the first time I’m embarking on such a mammoth task. I am thankful for Ps Ronald, who has given me the immense privilege of being responsible for these crucial administrative matters as well as for his patience in bearing with my non-stop anti-admin laments. I am also thankful for Ps Cuixian (who is the queen of administration) and her stupendous work of assembling the excel sheet – her formulas truly make the spreadsheets a work of art. Then I found myself petitioning to God for a personal assistant as well as two ministry staff (one each for R-AGE@GI and R-AGE@GII) to help ease my load in the coming year. I’m not kidding on this – I’m seriously taking in applications – talk to me if you want to serve God in the youth ministry in a full-time capacity. It’s going to be a gargantuan responsibility pastoring 300 youths so the need for more hands on deck is definitely there; I approach my role next year with fear and trembling but also with great anticipation and excitement. Well, while you’re considering joining me in the best job this world has to offer, help yourself to the slides and audio recording of last week’s sermon – about the importance of Memorising the Word of God. Heads up – Ps Ronald will be preaching this weekend (24/25 September) on Prayer as a Spiritual Discipline while Ps Leon will preach for the first time at R-AGE (8/9 October) on Worship as a Spiritual Discipline. I trust that they have a word in season for the young ones. In between, R-AGE will stage Same, Same But Different (where I’ll preach an evangelistic sermon tentatively titled, “Cheemism”). I trust you’ve been putting in effort to invite your friends to this service – it may just change their life forever (in every sense of the word)! Also, I’ll be heading to Perth (yes, again) for a week-long ministry trip with my revered mentor (as well as to catch my breath!) in early October and only after that will I return to continue the sermon series with Fasting as a Spiritual Discipline. I trust you’ve enjoyed the series so far. I look forward to leading a spiritually disciplined youth ministry. 1 Timothy 4:7b (NASB) >>> …Discipline yourself for the purpose of godliness. is your church still relevant to its community? Recently, I had the privilege of hanging out with my key leaders from R-AGE @ GII and R-AGE @ GI at its respective planning retreats in iHotel @ Batam and Salvation Army @ Bukit Timah respectively. One of the activities I led them in as part of an evaluation exercise was to list down every programme that our youth group had embarked on in the last year – from cell groups, to youth services, to conferences, to regional outings, to Christmas parties, to Easter productions, to ministry meetings, and to church retreats; I wanted a comprehensive laundry list of everything that had taken place in our ministry. Both sides did this with relative ease and easily came up with 40-50 (!) programmes. Yes, we were stunned by the sheer number of programmes. That was our first epiphany. Win: evangelistic or pre-evangelistic in nature. Equip: trains and ups the level of leaders and members. Build: grows and fortifies the fellowship of the believers. Both sides arrived at similar results – on average, less than 15% were Win programmes, another 15% were Equip programmes and approximately 70% of what we had planned and executed were predominately Build programmes. Needless to say, my leaders were flabbergasted; they shared my same reaction when I completed this exercise myself at the beginning of the year. I also told them to consider how a Win programme would naturally include Equip elements and inevitably Build the youth group. That was our second epiphany. What I got us to do next was to name as many known felt needs as we could of the respective communities we were ministering in; R-AGE @ GI and R-AGE @ GII had obviously listed different needs based on the demographics of its vicinity – we’d be foolish to plan and execute similar programmes for an affluent Tanglin community as we would the heartland Bukit Batok community. I told them to think about the needs that their sheep had and to their (and my) astonishment, some of my leaders struggled to even name these needs because they weren’t cognisant of it. Bottom-line was, we do not really understand the felt needs of our respective communities (and honestly, we ought to be chagrined by this). That was our third epiphany. That was our fourth epiphany. It was only after four self-discovered epiphanies that I released us to proceed with the budgeting and programme-planning exercise. I told them that it was imperative that these four revelations formed the backdrop in their minds before they strategised for 2012. Does the neighbourhood know the existence of the church? Does the church even meet the needs of its neighbourhood? Is the church serving the neighbourhood effectively? Is the church making a difference in the neighbourhood? Would it matter at all to the neighbourhood if the church suddenly disappears? So, is your church still relevant to its community? I’m not sure about you, but I want to ensure that my ministry is. With that conviction (hopefully) drilled into my leaders’ hearts, I am hopeful that the programmes that they have dreamed of for 2012 would have a greater relevance to (and impact on) the youths in both Tanglin and Bukit Batok. Otherwise, we’re really wasting our time, energy and resources doing what we do. Let’s get real and stop kidding ourselves. If we are irrelevant, we are useless. If we do not contribute, we should cease to exist. If we are not even meeting their felt needs, then why would young people even want to join our youth group? Come on, we must have a vision that is bigger than ourselves! R-AGE must never be a feel good club – certainly not on my watch! new R-AGE memories are now in your hands. 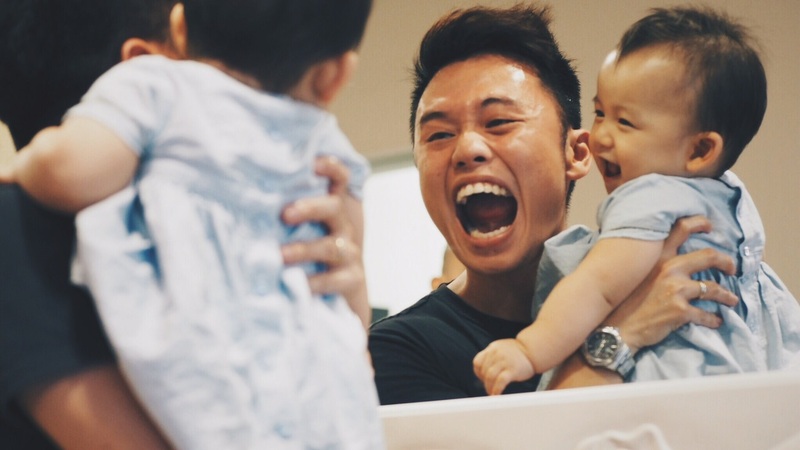 A church brother who wishes to remain anonymous decided to sponsor four youths to a gig photography workshop conducted by a renowned local photographer called Aloysius Lim. He approached Ps Cuixian and I to nominate four youths each from GI and GII for his selection. One of the pre-requisites for selection was that the four selected youths must serve the church as a photographer for one year. To cut the long story short, Evangeline Tan and Nicholas Wong were the representatives from R-AGE @ GII and they attended the workshop held at Esplanade this afternoon together with a few others. I was delighted for them as it seemed that they had a splendid time learning and getting exposed (no pun intended!) to other masters of this fine and necessary skill. R-AGE and Grace AG have benefitted from outstanding photographers like Caleb Kay, Jonathan Wong and Gideon Lim (all products of R-AGE by the way…) over the years and in recent times, Aaron Quek. We really should credit these faithful behind-the-scenes folks-in-dark-clothes for contributing more than 50% of all official church photography. P/S: This reminds me that I should not give up on my Be a Barney project and quickly get the website sorted out because I have a ton of cards already printed and waiting to be sold! I should also add to my existing collection – be it shooting new photographs or editing existing ones. I must make use of the off-peak work period to get this fixed…! meeting the folks who made the youths. Just had an amazing lunch session with another youth pastor and I think I may have found the solution to unite the church as a family! Wooh! Today, I think the youth ministry took one step closer to realising that vision. And it has everything to do with putting young people together with fathers and mothers. I remained obedient to the vision that God put in my heart about a year ago to network with the parents of my young people, and successfully brought it to pass in the ministry today. The session today affirmed my appreciation of the “Family” element in the Grace AG “DNA” and I tapped on it to potentially bring the youth ministry (and maybe the entire church) to the next level. Not many people know this, but if there was a group of people who I am most reluctant to be with, it would have to be fathers, and to a lesser extent, mothers. Perhaps it is because I do not normally interact with them; or because I did not grow up with a fatherly figure; or because there is a generational gap caused by age; or because I think they secretly scrutinise and criticise the youth ministry; or because I think they have no interest in what I have to say to them; or simply because I do not have much to offer them with my limited life experiences. Good session – cleared some doubts. Organise some teens-parents bonding session? Encourage leaders to communicate with parents if they should notice inconsistent behaviour. Keep parents posted on the cell material so that the topics could be discussed in the family. We would avail ourselves as a couple to listen to and help the youths and even their parents. Host a cell group [at my house] – need not be a cell my child is in. You guys have done a great job in nurturing the kids in their teenage years especially in their spiritual growth and character building. Keep it up! I expected a turn-out of 20 but nearly 40 parents showed up today. I expected a bored, restless and uninterested group but I saw genuine enthusiasm as they participated in the ice-breaking activity and patiently sat through the hour-long ministry update. I wished I got a dollar every time I saw a parent nod his or her head with me in agreement. I took the risk to give Keith and Yixian the opportunity to (re)present the cell and service elements respectively and they have exceeded everyone’s expectations of them – I am so proud of my beloved proteges! I thought Melody and Bradley did a superb job at organising this event with limited time and resources. I saw a beautiful scene of “Family” at the ground floor after the session – teenagers, youth leaders and parents freely mingling and chatting with each other over dinner. That’s precisely what a family church is all about! I was surprised to see how genuinely keen these parents were to be a part of what R-AGE did, does and will do. I could almost see it in their eyes that this session was like an answered prayer for them. I expected a tricky Question-and-Answer session but I ended up receiving generous words of encouragement from two fathers. I also received an insight into the real fears, struggles and concerns of parents with teenage children. It was beyond my wildest imagination to see at least 35 parents responding to my pseudo “altar call” of committing to being a secret prayer warrior for the youth ministry and its young people. We now have one parent committed to interceding for one R-AGE @ GII GGL (who’s not related to them) for six months. We made history today by organising the inaugural Meet-The-Folks session; as far as I can remember in my 14 years in Grace AG, and confirmed by parents who have been in Grace AG for more than two decades, this was definitely the first time something like this has happened. And we were all most grateful for it. We are all looking forward to the next Meet-The-Folks session, perhaps at the end of the year. We have a bunch of parents who sincerely desire to make a greater contribution in their teenagers’ life and ministry. We are on the threshold of a new culture being established in Grace AG – championed by its young people. a change of plan or a plan of change? I led my wonderful team of dedicated Shepherds to Batam’s iHotel over the weekend; this was our first independent ministry-planning trip and I must say I’ve thoroughly enjoyed it. I trust that my Shepherds had also enjoyed this time of reflection and evaluation that I had carefully designed for them to embark on. I’ve journeyed with them for 18 months now and while it’s been a wonderful ride, I desire for them to grow deeper in their individual walks with God. Keith and I arrived slightly later than the rest of them as we had to oversee the collaboration with the Grace Kids at GII Sunday services; it was also the first time I had the opportunity to be the emcee in the adult services. (I improvised from what I thought was a messy first service and I am grateful that the second service turned out much better…) I am confident that the adults now know that R-AGE @ GII exists and that it’s the best place to be at on a Saturday afternoon. It was great to have caught up with Keith on our journey to Batam. I’ve always identified him as one of my successors and I’m confident that he will be able to lead R-AGE @ GII to greater heights where I could not. Keith, you will surpass me and I will help you to do that because I believe so much in what God will do through you. (: I am blessed to be able to mentor an exceptional young man like him. I bunked with Bradley for this trip and I thoroughly enjoyed bonding with him and knowing him more intimately. We had a good time catching up in the room and in the pool. I celebrate his appetite to get out of his comfort zone – that’s the mark of a G0d-fearing and Christ-loving disciple. And I look forward to hearing his reflections on a passage of Scripture I asked him to meditate upon. We decided to have seafood dinner at a roadside coffeeshop – yes, those typically dirty and warm ones (with pesky buskers) and the overpowering aroma of belachan chilli that clogs up your respiratory system. I must say I was impressed with the team’s courage to eat everything that came their way (although some felt queasy after dinner). The best thing about the feast was its price – we ate a mountain of food for a mere 10 SGD per pax. The first activity we embarked on after dinner was “Dials on a Dashboard” – a little exercise I’ve adapted from Wayne Cordeiro’s excellent book, “Leading on Empty”; I got my Shepherds to systematically recognise, rate and recalibrate the various dials on their dashboard. It was a brutally honest activity and it set the tone for the contemplation they would embark on. It is my earnest prayer that everyone in the team would UP(a)GRADE in their own faith pilgrimage. I am eager to grow, as I always have been, and I have already put into action some things as soon as I arrived home. May the Lord continue to give me grace as I seek to please Him in all that I do. I encouraged the team to wake up early the next morning to do their devotions on a passage of Scripture (Hebrews 12) that the Holy Spirit revealed to Yixian during the Dashboard activity; I thoroughly enjoyed receiving insights and understanding from the Lord as I meditated on and memorised His Word. It was an empowering experience! MAN, I LOVE THE WORD! It turned out to be a powerful exercise as this soul-searching activity became a heart-wrenching experience for a few of them. One Shepherd (whose identity I shall protect) even broke down during this activity. We ministered to her on the spot and tears flowed freely – not just on her cheeks but on those who were standing in the gap for her as they laid their hands to pray for her. It was a moving scene indeed… This is unity… This is the body of Christ… This is biblical fellowship. I was led to get everyone to worship God together before every session (with David’s iPod and two speakers no less!) because I believe that it’s important to engage the Lord in any crucial decision; I felt that it was imperative to make decisions in the presence of God for it’s always in the presence of our living and loving God that our lives are changed to be more like Him. And so it was – God is faithful – this was ministry at its finest hour. And it wouldn’t have been possible without the Spirit’s conviction. As part of my bid to sort out my health, I had already completed 10km on the treadmill within 24 hours of arrival and was about to go for my first swim in eons; it must have been more than six months since I last put on my goggles. On a lighter note, I discovered the power of my physical presence – some of the girls who were in the pool disappeared (more like ran away) within seconds of me entering it to swim my laps; it’s like they saw a ghost or something. HAHA! We waved Esther, Natalina and Huiyi goodbye as they left a day earlier due to prior commitments. The rest of us went to the nearby Nagoya Hill (for the umpteenth time!) for dinner at another local establishment. The most hilarious scene must have been when Bradley and I literally carried the table top without its legs. You must see it to believe how ridiculous it looked! Should we keep it or trash it? If we plan to keep it, how can we improve it? All of us unanimously felt the need to be even more evangelistic in the way that we operated. When we plan “Win” events, we will naturally need to have “Equip” activities and eventually it will result in it being a “Build” event. I saw in the Shepherds’ eyes a conviction to be intentional, intensive and inclusive in all that we would plan next year. I was glad to be able to transfer what I had learnt from a conference to my team of leaders. (I was tickled to see the contrast between my M&M’s (Melody & Melissa) – one was bustling with energy and the other completely zapped!) We spent the next few hours affirming one another with objective, subjective, introspective, retrospective and most importantly, heartfelt words of encouragement. I am confident that this is the first time the Shepherds were encouraged on such a scale – I pray that it had lifted their inner man/woman. (: Well for me, I went to bed feeling great and grateful about what the Lord is doing in this season of my life. Our final activity was inspired by 2 Corinthians 5 where I reminded the Shepherds of our duty and need for the ministry of reconciliation. I shared with them openly and honestly on my own attempts to reconcile with a couple of people in my life (and I am proud to say that I’ve already taken reconciling action tonight, as soon as I got home). I believe that as we grow as a ministry both in quantity and quality, through processes and programmes, cracks of misunderstanding will appear in our relationships; these are inevitable for when iron sharpens iron, there is heat and friction. And when cracks appear, the devil will too, with his lies and deception. We must not fall for it – hence the great need to reconcile each other to Christ (and to each other) and to clear up any potential or active misunderstanding before it erodes into bitterness. By the end of this retreat, we had evaluated the three main components of ministry: people, programmes and processes. We had also recorded feedback for the various programmes that the ministry had executed on the service, cell and events level. I am hopeful that this Retreat had been in line with the coming 40DOC campaign, and sets the tone for personal renewal and corporate alignment. Praise the Lord for all that He’s done through me at this Shepherds Retreat – A change of plan of a plan of change? I challenged them (and now you reading this, and eventually R-AGE) to remove “Arrowed” or “Bombed” from their dictionary for that’s a secular and selfish way of thinking. Instead, let’s train ourselves to say, “What an opportunity indeed!” whenever we are given the privilege to do something for the Lord and His people. But if you are simply unable to lend a hand due to your existing commitments: “Don’t be a dead-end, but be a Y-junction instead.” So that when you really can’t help when people approach you, you can still help by pointing them to other people who may be able to help them. This results in their burden being lightened regardless. We are a team and this is a team effort; let’s behave like an Ephesians 4 team! I have never desired depth in my life and ministry as much as I have right now. Oh Lord, please give me Your grace and enable to grow myself and R-AGE in a deep and riveting manner. Hear my cry, Lord – I do not want to raise a shallow generation of believers!